View cart “Thermistor Temperature Sensor Module” has been added to your cart. The MAX6675 Thermocouple Temperature Module is a K-Type thermocouple with digital converter that has a range of 0°C up to 80°C with supplied thermocouple.. The MAX6675 Thermocouple Temperature Module is a K-Type thermocouple with digital converter that has a range of 0°C up to 80°C with the supplied thermocouple and up to 1024°C with a suitable high temp thermocouple. This module utilizes the MAX6675 IC which is a cold-junction-compensated K-Type thermocouple to digital converter. The MAX6675 has a maximum measurement range of 0°C to +1024°C depending on the thermocouple it is paired with. Thermocouples work on the principal that dissimilar metals that are welded together at a single point will create a small voltage that will vary with the temperature. The main advantage of thermocouples over typical thermal sensing electronics such as the DS18B20 is that the sensing range can go much higher since a robust metallic probe is used to sense the temperature while the electronics hang back in a safe location. The flip side is that the reading may not be quite as accurate using a thermocouple. Thermocouples come in many different varieties from very fine wires if you want to measure a small object, to very thick metal sheathed wires with very high temperature ranges. 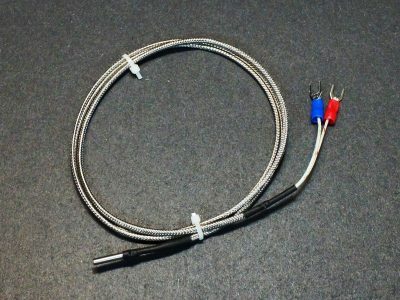 The thermocouple that comes with the module is approximately 18″ long and terminates in a threaded connection. The threads are M6, but 1/4″ – 20 will also generally work. This type of connection can be used to mount the thermocouple to something like a heatsink if desired where it can be screwed in or captured with a nut. The module is compatible with any K-Type thermocouple, so that component can be swapped out if desired. 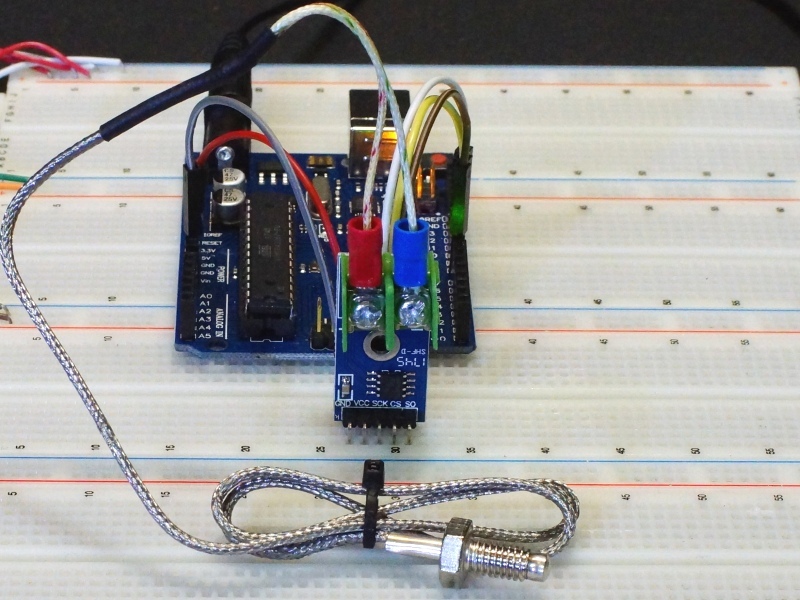 The module interfaces with a microcontroller via a 3-wire SPI interface. There are libraries available that make interfacing very easy as shown in our example below. When hooking up the thermocouple, the red lead of the attaches to the ‘+’ terminal on the module. GND = Connect to system ground. This ground needs to be in common with the microcontroller. 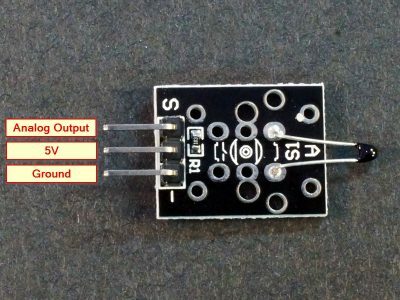 VCC = Connect to 3.0 to 5.5V. Typically connected to same Vcc as microcontroller. SCK = Serial Clock Input. 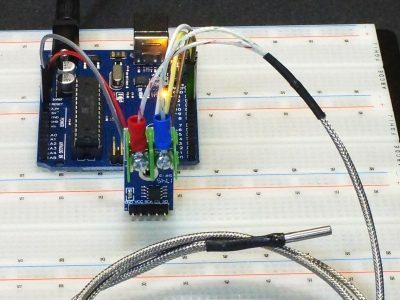 Connect to any digital pin on microcontroller. CS = Chip Select. 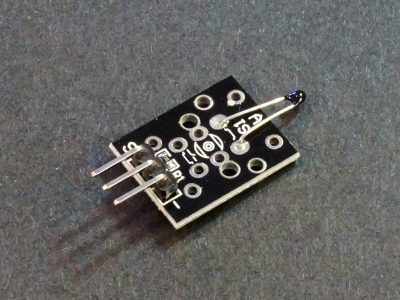 Connect to any digital pin on microcontroller. SO = Serial Data Ouput. Connect to any digital pin on microcontroller. This is a commonly used module for temperature measurement. Though the supplier rating for the thermocouple is 80C, we have run them up to 150C with no issues noted. Do take note of the fact that the probe end or stainless steel braided shield cannot be grounded or the sensor readings will be incorrect. We measured a typical current draw of the module at 500-700uA and the MAX6675 chip max spec is 1.5mA. A common misconception is that the module draws up to 50mA. That spec comes from the max current the SO pin can deliver, so that high current would never be seen under normal operation. Since the module draws very little power (<1.5ma), it can even be powered from a digital output pin on the uC if desired. If this approach is taken and the power is turned off to the MAX6675 between reads, the power should be allowed to stabilize for a couple of seconds once power is applied before a reading is attempted. Also keep in mind that though the reading resolution is 0.25C, the overall accuracy is ± 3C. This is typically fine for most applications when measuring higher temperatures as thermocouples are typically used for, but if you are trying to measure basic ambient temperature, the reading may be off by a couple of degrees. On the thermocouples that are shipped with the module, the lead with the red terminal goes to the positive ‘+’ terminal on the board. If the leads are reversed, the temperature reading will go down when the temperature goes up. If that happens, just swap the leads around. Once the MAX6675 library is installed, using the device is fairly simple as shown in the code snippet below. Just hook up 3 digital pins to use as the SPI interface (we are using pins 8,9,10 in the example) and provide power and ground. This program just takes readings every second and reports the temperature in degrees Fahrenheit and Celsius to the Serial Monitor window. Packaged in a resealable ESD bag for protection and easy storage. These thermocouples were originally designed for use with 3D printers, but they can be used for various other temperature measurement applications as well. The DHT22 Humidity / Temperature Sensor Module uses a 1-wire interface to report both humidity (0 – 99.9%) and temperature (-40 – 80°C). 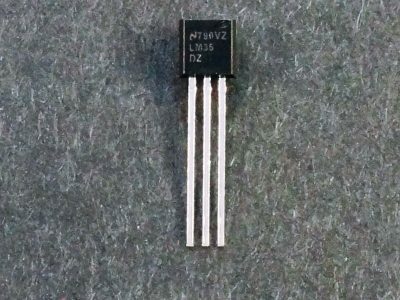 The Thermistor Temperature Sensor Module uses and NTC thermistor to measure temperature and provides and analog output. 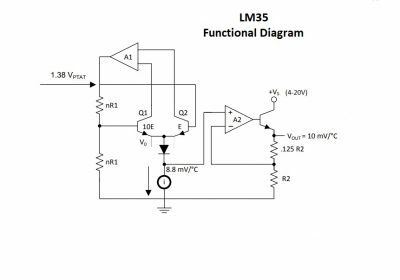 The LM35 Analog Temperature Sensor is a popular option for temperature sensing over the range of -55 to 150°C.